Ron Tsang - From Presentation To Standing Ovation — Stop. Start. Do. 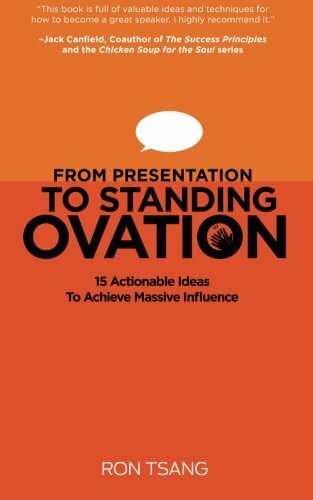 He's a presentation skills expert and author of the Amazon Canada #1 best-seller “From Presentation to Standing Ovation”. Unlike most public speaking coaches, Ron is a former stock analyst who has been pitched to by thousands of CEOs and CFOs. Ron was responsible for evaluating these presentations, so he has a unique perspective on how to communicate at the highest levels. Ron, welcome to the Unleash Your Inner Genius Podcast! Tell us about the work you do and how you became interested in public speaking? What is your definition of effective communication? For this next question, we’re going to assume that the person listening is not terrified of public speaking. For those of us who want to improve their ability to communicate to others, where do we begin? What techniques or rituals do you recommend for getting in “the zone” before public speaking? How do we develop a natural speaking personality and use it to win over hearts and minds of our audience? Why is storytelling important and how can we use it to improve our presentations? What’s the number one thing you consistently recommend to your clients in order to improve their public speaking and communication? Any additional habits or suggestions for communicating with power and influence? Learn new information and apply it! An egg timer in the shape of a pig! Where’s the best place is to connect with you? Click On The Cover To Get The Book!